BLACK FRIDAY 20% OFF SALE! ➤ DURABILITY: We have used the highest quality bamboo wood in manufacturing our bread slicer guide which is natural and does not contain any harmful bacteria in it. Solid materials, smooth finish, compact design makes it perfect for everyday use. ➤ PERFECT SLICE: It's the perfect slicer guide for your homemade bread. It won't be a hard target to cut even slices. You will also have a choice to cut a slice of your desired thickness without risk of cutting your fingers. 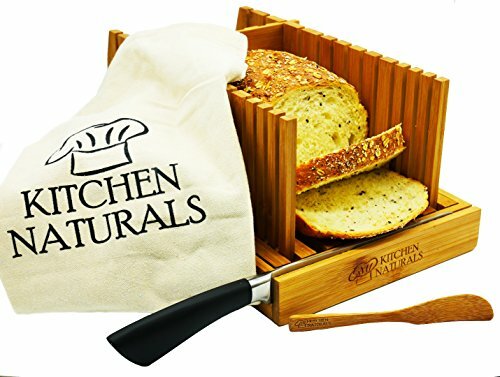 ➤ EASY STORAGE: Kitchen Naturals bamboo bread slicer comes with a knife rest and storage bag. You can easily make it ready for everyday use in seconds. When your finished cutting bread, you can easily clean and fold it flat to fit in your drawer. ➤ CRUMB CATCHER: We all are tired of cleaning crumbs after cutting bread every time from our table. We have equipped this bread loaf slicer with a built-in crumb catcher tray so you won't have to worry about cleaning your table anymore. ➤ GUARANTEE: We back our product with a replacement & money back guarantee. If you are not happy with our product's performance, you can claim a 100% refund on the purchase price or in case of any issue you can claim a replacement.